Paul will have his Mobile Shop at the ARC 531 Lower North East Road Campbelltown 5074 for the 2017 Australian National Championships 24th September to the 30th September 2017. Come along an s.. The Table Tennis World Mobile Shop will be at the ACT Open Championships this weekend, Saturday 16th and Sunday 17th of September 2017. The ACT Open Championships will be played at the Tuggeranong .. 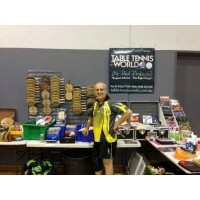 The Table Tennis World Mobile Shop will be at the 2016 Senior National Championships, being held at Seagulls Table Tennis Club from Sunday September 29th through to Saturday October 1st. The Senior..